THERE ARE SEVERAL WAYS TO HAVE A GRAVITY NULLIFICATION EFFECT. THIS GUY HAVE FOUND ONE WAY THAT WORKS. THE PRINCIPAL PHYSICS IN HERE CAN BE TAKEN AND PUT INSIDE ANY TRAVELING MACHINE – AND IT CAN FLY. THIS PHOTO IS PART OF A VIDEO I have seen. It was taken by a man who came upon a disc sitting in the woods like this. He walked up to it with his Video Phone running, and got some really good footage – – before his abduction – – the question is: What kind of Gravity Nullification system are they using ? A lot of you are not grasping these concepts of negative energy, electrostatic fields versus electric fields, electrostatic CURRENT versus electromagnetic current, and electric current versus electrostatic current. It confuses you that a static (not moving) field can be in motion in a current. In my Tesla tower experiment, I tapped two points on the ground, one in the yard from the big Tesla tower, and another point on the ground right outside my house from the inside smaller Tesla “console” as described on the Tesla Engineering Physics page. Originally, the ground was tapped under the tower using a thin brass ground rod, but the console at the other end just had one end of a copper wire stuck in the ground. The bottom of the 4 foot coil was touching a contact plate on the floor, and from that plate ran a wire to the outside of the house, stuck in the ground. The other end of the coil went up to the thin metal squirrel cage with a hollow copper sphere attached to it. Console (receiving / transmitting pedestal, depending on its use) on the left. Tower on the two right images. It was all powered naturally from the Earth surface charge of the ground. Due to the material of the ground rods, I could measure the voltage, and raise the volts up and down, as I raised coils or squirrel cages up and down. On the center picture, the image to the right: the squirrel cage could be raised or lowered to control voltage. When I ran the AA battery from console to tower, the COIL could be raised up and down to control the current. The AA battery ran one end out to tower via the wire, and the other end went to ground outside the house, connected right into the console, and measured at the tower. Now, when the tower was grounded to the rod, which you can see in the middle photo, the little hollow 1.5 inch copper ball sitting on top of a thin brass ground rod, in the middle of the picture. 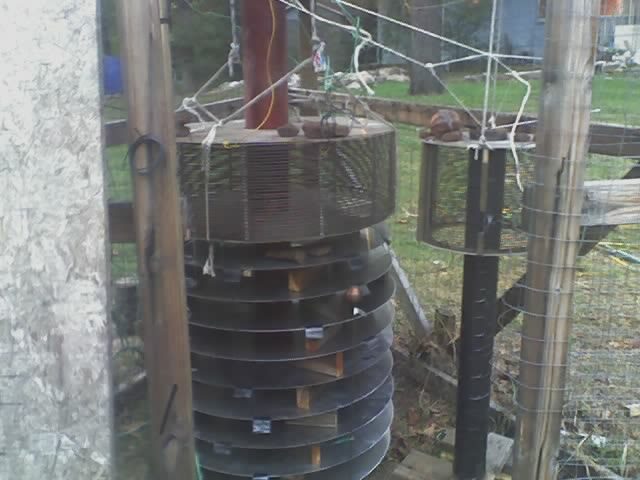 The tower did not have to be grounded to the rod, in order for there to be voltage in the tower, due to the nature of the static capacitor plates below the large squirrel cage, transmitting the Earth surface energy to my large coil. But, when it was connected into the ground rod, then at the console end, there you see the two big spheres, but two smaller spheres on both ends of a small brass rod is in between the two larger outer spheres. Those two smaller spheres connected together via the brass rod ran through a piece of wood on a swivel, so I could rotate that assembly to close the gap or open the gap. A massive electrostatic charge that I did not even want to get close to would form around the console. It felt very tingly, and very dangerous. At the tower end, it felt much different. It felt like electrical water. Seriously. Not like electrostatic dangerous charge, but like an electrical water — which is a different kind of electrostatic field. I consider it as a field of Earth electrical chi, because that is the best way to explain it. The voltage always remained the same because there was no usable magnetic wave; no usable magnetic signature, no ability for there to form an electromagnetic field. I tried it. This electrostatic field was not in motion to create an electromagnetic current. Although . . . . . I could run this electrostatic charge along a wire. That is the weird part. Since then, I’ve changed out my ground rods, used bigger rods, etc, of dissimilar metals to create electromagnetic current — so now, it’s polarized, and able to move around; however, it was able to move around from the get-go, but now, it’s polarized. Simply put: The electrostatic current needed to be polarized, so that an electromagnetic current could form. I cannot put this any simpler. This is the basis of the new Tesla tower Ley-line experiments, which I have a lot of data, and a lot of schematics, that I’m not going to post up online for free, because I want credit for the work. Already, others are using some of my signed images … and charging money to use them in their lectures. This is why I’ve held back a lot, and waited until I had more data accumulated, to make a good presentation, so I can fund further development toward warp drive creation. ​I still have a lot of tests I need to perform to map all this out. If you have a bare wire that is conducting high volts and high amps, you may not know it’s a live wire until you touch it, and then you get shocked; and if it’s very high current, it can be lethal. You get shocked because of the presence of a magnetic aspect (electromagnetic) to the energy, and because of high voltage. That wire is creating an electric field. However, an electrostatic field, you can feel it before you even get close to it. Lightning is electrostatic in that when it hits nearby, you can feel the energy field from it for quite a ways away! Lightning is electrostatic, and can travel over a span as it discharges. When it moves, it tends to have a magnetic quality to the wave but …. not always. However, lightning discharges that move around, or such electrostatic discharges from the top conductor of a Tesla coil to a nearby conductor moves energy from one point to another point, from point A to point B. Point B can be run on a wire to a distant source, in a current of electrostatic energy; however pure electrostatic current will not harm you, because of a lack of magnetic polarization (electromagnetic polarization; presence of a magnetic field). When lightning occurred nearby, I could measure a large voltage increase in my original Tesla tower setup. But, I was not getting shocked when I touch it, because it was not polarized electric energy, even though lightning had induced a high voltage in the system from lightning discharges in the air, somewhat nearby, but probably a lot farther away than it looked. Also lightning would dance overhead the tower during storms, and the tower shielded the local area from taking direct lightning hits to ground. I have yet to try this in the new Tesla tower Ley-line setup, which harnesses polarized electric energy. What I mean by polarized is magnetically polarized. So a normal electrostatic charge, you give it a magnetic polarization and it becomes a magneto-electrostatic charge. As said above, electrostatic current could be run on a wire so that at the end of a long distance of wire from the tower, there was voltage measured at that end, measuring from the end of the wire to ground. More voltage was measured when a resonance coil was connected to ground, and the end of wire measured relative to that coil. The coil raised the frequency of the distant spot of ground (two distant points along the ground). Frequency in pulse motors is in regard to how frequently for example a spark would form in a spark gap (easy to explain this way). Low frequency, the spark would arc say about in one second intervals. Higher frequency, the spark is arcing much more rapidly, many times per second. High frequency is virtually a steady stream — a virtual current of what resembles a steady spark, standing there (static; not moving), but can rise up two bare wires, in like a Jacob’s ladder type of setup, just from the collapse of an electromagnetic field in an electromagnetic coil. Frequency is related to vibration. All matter vibrates. The faster the vibration, the higher the frequency. In a resonance coil, it deals more so with vibration, but also with distance. For example, a short resonance coil versus a long resonance coil, having many more turns of wire, makes a higher frequency. If you look a wave, with its ups and downs, the more times the wave crests up in a span of distance, will be the measurement of the frequency of those waves in that span of distance. Electromagnetic current for example, spirals around a straight long wire. Those spirals is what the spirals of a resonance coil will resemble, which controls the frequency and also the voltage, because it simulates a longer distance of travel, but compressed into a shorter span interval. So a thousand feet of wire can be coiled in a 2 foot resonance coil wound around a 2 foot pvc tube; but the overall span of the wave is a thousand feet, and it’s frequency is the number of turns that the wire spirals around the 2 foot long pvc pipe. At high frequency, from the collapse of an electromagnetic aspect of the wave, an electrostatic current run to a bare metal conductive plate (a charge plate) will not be lethal. Tesla stood on such plates and his whole body lit up with static discharges but at high frequency, at a million volts, but he was not immediately incinerated, instead it just traveled harmlessly over his skin. A Van Der Graaf generator, one can touch it and their hair stand straight up, as long as it is not on the ground, so there is not a current running to ground. Otherwise, a Van Der Graaf generator can emit electrical arcs, between a spark gap, and if you touch those then you get shocked real painfully. Stun guns use the magneto-electrostatic discharge in such a manner to stun people. It is derived from the collapse of the electromagnetic wave though. There’s a difference with the output of a stun gun, versus the output of touching one pole of high voltage on the hollow copper sphere of a Van Der Graaf generator. I would never touch the output of an induction coil, unless it is run on a wire from the positive output terminal (because it cannot go to ground since the surface charge of the ground is ALSO a positive charge). Simple enough. There’s differences involved here with types of current. Typically speaking though at ultra high frequency, a spark output of a induction coil run through another coil in a monopolar discharge (like how a primary coil induces a secondary Tesla coil — 4 foot coil let’s say — and discharges from the top conductor) demonstrates one pole discharged magneto-electrostatic current, which some people have demonstrated safely touching it while holding one end of a bare metal rod, and touching the other end of the rod to the discharge. ​Look at the setup. There’s a little coil of wire winding around the tall coil of the console. That little coil of wire of only a few windings connects to the DC induction coil. That is a DC induction coil, not AC … it’s wrong in the picture. If the coil is connected in one polarity, the static discharge is on top toward the ceiling. If it is connected in the other polarity, the floor gets charged instead. Monopolar discharge is the movement of an electrostatic buildup in the console, and in the long coil, to push that energy either up, or down. If down, it’s spread out along the floor due to the conductive floor plate. If on top, it can spread from suspended conductors, and even do so wirelessly from conductor to conductor (each conductor is a hollow metal sphere, or shape), like how lightning travels from cloud to cloud. Chances are if you are standing barefoot on the ground, and you touch the top output, it travels through you to the ground, if it is in a negative polarity out the top, because negative charge attracts to positive charge, and the ground is a positive charge. Normally, except in artificially created conditions where you can charge the ground with a negative charge by pushing that energy in one way, overcoming the ground charge. Sometimes lightning can do this, and completely neutralize the ground charge where all the residential houses are grounded to for their return current pathways to travel, and knock out electricity for as long as that lightning bolt is discharging to the ground. A car battery for example…. If you connect the battery charger in the wrong polarity, all of the interior lights may stop working due to a counter-opposed charge to the battery (in older cars this will happen). Negative energy is harder to explain because it can take various forms of energy, but you know it’s negative energy by some characteristics, like for example over-unity output, or not being shocked as Tesla did in his mysterious setup (which I do not recommend trying) … As a note here, flyback output from the collapse of an electromagnet at very ultra high frequencies will appear as a thin whispy type of plasma, not as lightning, but only in certain conditions is it harmless. Observe safety precautions. ​The only way I’ve been able to understand it is to map out it’s patterns of behavior, of action, of geometry, etc. To this end, I will have to publish some material regarding negative energy with diagrams and schematics and stuff and experimental results and validation; otherwise it is described all throughout this website. I do want to make note of scalar wave transmission of electrostatic current as being a representation of negative energy. This is a paradoxical type of energy, with exotic characteristics, and can be either electrostatic, or magneto-electrostatic mostly. As electromagnetic energy, it will induce electrostatic fields particularly involving Tesla systems and Bedini systems, built on the Earth surface or in portable systems, and is reactionless and overunity in its characteristics, and can be very difficult to directly measure, but must be measured through indirectness, AND is capable of wireless transfer of power without any loss of current, and usually there will be a build-up of current as it travels in resonance — Point A to Point B, and at Point B the output is higher than the input at point A. …. I will have to come out with some separate publications, as I’ve said repeatedly (including OTC-X1 hard data, possibly, except for videos which will be openly shared), otherwise this article summarizes the information in this website, to make it easier to understand in one little simple article. Other articles on the Construction blog like “Negative Energy Characteristics” goes into more detail; however this one article should at least clear some things up, and be a quick reference for clarity’s sake. Last thing I should do is “mansplain” the Bedini energy. It is considered a universal power source, able to power small electronics, large electronics, electronic control systems, each with their unique required input volts and amps. The thing is, the Bedini energy is high voltage! But, it’s derived from flyback from the collapse of electromagnetic fields in coils. Even at high voltage, this energy is able to charge batteries at low voltage (high volts will charge 12 volt batteries at 12 volts — weird, huh? ), and operate electronics and charge small batteries like cell phone batteries, while keeping the circuits and components cold (not overheating); electronics LOVE this energy. It’s a weird energy type and fits within the realm of negative energy types due to its overunity characteristics and other characteristics such as cold energy. Energy gets hot in an electromagnet when the electromagnet pulses — filling the coil with a field, collapsing a field, forming the field, collapsing the field, forming it, collapsing it, etc. The way the electromagnet gets hot is on the forming of the field cycle, not upon the collapsing of the field cycle, although when the field collapses, it does not cool the electromagnet. ​The MVP pulse generator is our current overunity basis of technology, capable of running a load and simultaneously charging back up its battery, and charging a bank of 10 batteries in the process, and running inverters. So the MVP is running from a battery, charging back up it’s own run battery, and charging 10 more batteries, and running two inverters, and a battery charger, and an electric drill, and still charges its system without depleting any energy. The overall output wattage in all these terms is greater than 15 times the input voltage. Running the self-looping circuit, two inverters, a charger, this is NOT INCLUDED in the output rating of 15 times over unity. This flyback voltage has unique properties, and again, fits into the realm of negative energy characteristics. If it’s able to run electronics, then it’s able to form an electromagnet from it’s flyback voltage. This means it’s a very good power source for the OTC-X1 and the LAU-X4. The MVP requires considerable amount of research in order to understand it. There are several articles on this website where it is featured. Look through the website. Find what is here. A lot of people get stuck on terminology, like “high volt current” or … “flyback current” versus “electromagnetic current.” These describe the characteristics of current and types of energy. Some people even get confused on “12 volt amps” versus “120 volt amps.” …. Watts are volts X amps. 12 volts X 10 amps is 120 watts. 10 amps, wow! That’s like able to run a small space heater or toaster! NO! Not at 12 volts. Let’s put it to you this way: 120 volts X 1 amp is 120 watts — SAME WATTAGE AS BEFORE. 1 amp? Well that can’t do anything but run a few light bulbs! … So this is why I make it known what kind of amps, at what voltage, because if someone is saying that their generator puts out a lot of amps, then that is not enough information to go by, because amps can be weak or strong. If someone says their system puts out a lot of volts, that is not enough information because volts can be high but the current MAY only be in milliamps. Those not experienced in building solar and wind hybrid systems, backup systems and whatnot, don’t really appreciate why I like to make such distinctions. Don’t be too left-brained imbalanced! Use that right creative / abstract brain hemisphere in balance — right and left balance — to understand things that are plane to see, and obvious. When I say “electrostatic current” — an electrostatic field versus an electric field that can be run on a wire — don’t think that I am making this statement out of ignorance! I am denoting the difference between energy types! Electrostatic current versus electric current are different energy types with different characteristics! I HAVE to make these clarifications known because you have not built a Tesla tower radiant energy system and have not experienced these weird Tesla energy types that I have, and that those working with me have also experienced. A low volt and low volt current that creates a massive static field is a real thing that makes your hair stand up on end, but you cannot measure what is causing that massive static field — this is what Tesla had claimed as well, and why his Wardenclyffe project was shut down by J.P. Morgan — because if the energy could not be metered, then MONEY could not be charged for usage! Another thing people think I’m being ignorant about is when I talk about an electrostatic field that can be run on a wire as an electric current, and yet shows no sign of any type of electromagnetic wave. It can be run on a wire through an electromagnet, to a distant point, and still measure the voltage of the origin point, but not be able to form an electromagnetic field. In come cases, if the surface charge of the Earth has been conditioned for electromagnetic flows, then this CAN happen and an electromagnet CAN form, but the conditioning of the Earth surface in an area is sometimes natural, and sometimes it takes the use of polarized grounding rods in a Tesla tower system to condition the Earth surface charge (polarization is achieved in the same ways Earth batteries are used). People say no, this cannot happen, there cannot exist an electric current without a magnetic aspect to it. LOL I just don’t know what to tell those people. I have used multiple ways to make sure of this, that is *IS* real. Also people look for math. They think well, if there is no math, then it’s not real. Okay .. so then help me figure out the math, by helping me figure out the relations of energies involved, WHILE TAKING INTO CONSIDERATION that some of this energy CANNOT EVEN BE MEASURED ON A METER, but yet you can MOST DEFINITELY FEEL IT!!!!! … which they say, “well all it’s doing is making an ionization field” which is really odd because if it’s not making electroMAGNETIC current, how is it ionizing anything??? Not only can this energy be physically felt as a static field, but it can be recorded visually on a camera! The camera is a type of measuring instrument in this case, but it does nothing to tell us of any electromagnetic characteristics. I have not yet tried putting a solar cell in an energy force field, however, to check to see what it’s doing… I didn’t even consider that until just now, that photonic energy may also have a static field to it. I’ll say that again: IS IT POSSIBLE THAT PHOTONS CAN HAVE AN ELECTROSTATIC FIELD TO THEM??? There is a wire in the foreground, a rope actually which was my dog-run line. There is a tall resonance coil on the left side of the picture. 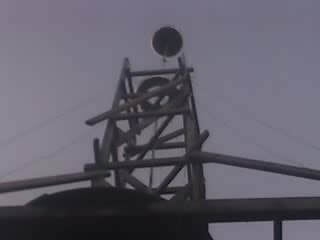 It is held up by three guy-wires (ropes) in a tripod type of support. Now … Do you see all those little wires that stretch from the left tall resonance coil to the big Tesla tower? See them all? They’re all in parallel. Well guess what. THOSE ARE NOT WIRES. THAT IS ENERGY, AND THERE IS AN ENERGY FORCE FIELD WALL BETWEEN THE LEFT TALL RESONANCE COIL AND THE COILS IN THE TESLA TOWER. You can also see a violet colored energy orb in the lower part of the Tesla tower below the first floor platform. ​There is also some horizontal framing about 2/3s up between the ground and the first floor platform which is what supports the safety cage I had around the whole bottom section. 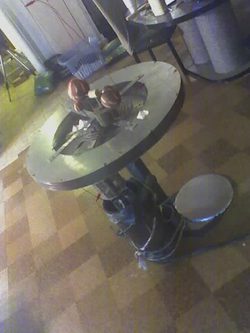 ​The violet-colored orb is harder to see, but it’s bottom portion engulfs the smaller squirrel cage on the smaller resonance coil and goes to just above the top of the first floor platform. 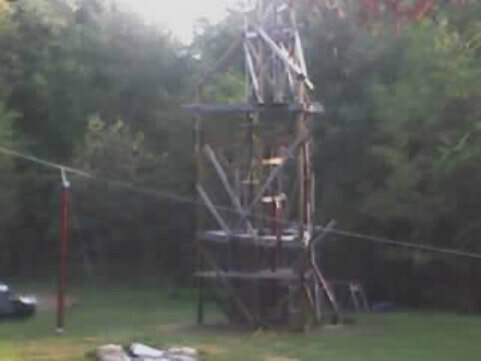 ​These things are fairly difficult to see, but my friends and I marveled over being able to physicall feel this energy force field wall, along with an energy static corridor going from big tower all the way down to the lake edge, and going from the big tower up to my house where I had a small stack of capacitor plates for my console ground (either field grounded, or direct grounded, to play with those differences). The grass, when not mowed would bend in a nice circular arc 90 degrees to grow into the cage to touch the field coils of the Tesla tower lower coils. That also boosted the voltage in fact, and took me a while to realize that the grass was a type of pure radiant energy “wire.” So these energy flows were present and observable in nature, and in many different ways; and also the animals responded sometimes to the energy, and even at the same instant I clipped the tower lead to the brass ground rod. Sometimes when I did that, dead tree limbs would drop all throughout the forest, at the same instant I grounded the tower, even on sunny days, JUST LIKE IT DOES right before a thunderstorm comes by. If you’ve lived all your life in a city, you would not understand the natural ways of nature. So again, when I say “electrostatic current” I don’t want to say “electric current” because people would then think that it is an electromagnetic current; even when electric field lines run in parallel, while magnetic field lines run in transverse (at 90 degrees), people do not understand that these energy forms can be separated and isolated. So when I say “electrostatic current” I’m also noting the origin of where and how the electric current is derived, whereas I also interchangeably use “pure electrostatic” and “radiant electrical” and such ALSO to denote these energy types. I’m not coming from ignorance when I make these claims that anyone is able to duplicate on their own, and is what was originally claimed by Tesla. These types of electrical parallel and longitudinal energies are scalar energies, which fit in the category of negative energy characteristics.